GRADING BARBER HALF DOLLARS Grading Standards for Barber Halves from good to very fine. 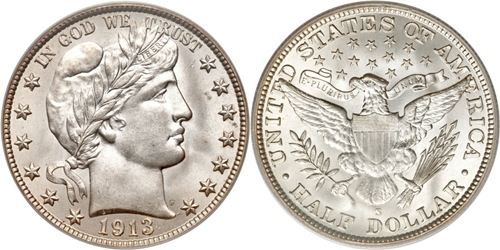 The first Barber Half Dollar was issued in 1892. The obverse depicted the profile bust of Liberty wearing a cap and laurel wreath. The reverse design was an eagle clutching 13 arrows in its right claw and an olive branch in its left. These half dollar pieces were also called Liberty Head Halves. Since, however, the head of Liberty has appeared on seven different types of U.S. half dollars over the years, the term Barber Half Dollar is officially used to describe this type of 1892-1915. The Barber Half Dollar was composed of 90% Silver and 10% Copper. Since pure silver is very soft, copper was added to all circulating silver coins to harden them and prevent excessive wear. Barber Halves had a weight of 12.50 grams, a diameter of 30.6mm, a reeded edge. The edges of most silver coins were reeded to make evident any attempt to shave silver off the coin. Note: Barber Halves struck in Philadelphia bear no mint mark.